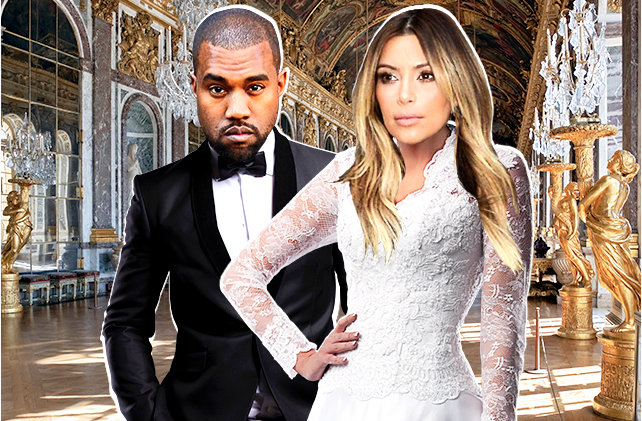 Kim Kardashian and Kanye West rumored to be getting married at the palace of Versailles just outside Paris, France. Kim Kardashian and Kanye West have zeroed in on one of the most opulent places in the world to tie the knot -- the Palace of Versailles outside Paris. There are reports that the couple will tie the knot in Florence, Italy ... in fact the Mayor's office even went on record confirming that. But sources familiar with the wedding plans say it will absolutely take place at Versailles, following nearly a week of parties all around France. A total of 3 French kings lived there and the palace and gardens are world famous to this day. Versailles is where Louis XIV famously lived in the 1600s. It's also where Marie Antoinette lived with her hubby Louis the XVI and was trashed for her lavish lifestyle. She famously said "Qu'ils mangent de la brioche" -- translated, "Let them eat cake," referring to the common folk who bitched at her. We gotta say ... it would be slightly awesome if Kim said it during the reception.